QUEEN’S ROAD (TIMES OF INDIA) – Seventy-three-year-old Ramamurthy is a diabetic who recently went under the knife. When he experienced difficulty in breathing, he dialled 108 for the emergency response services, and was soon attended to by a bike ambulance stationed at Sumanahalli bridge. The emergency medical technician (EMT) reached Ramamurthy, who was around 6 km away, in 15 minutes and administered first aid. After fixing an oxygen mask on the senior citizen, he tended to his hip wound. Meanwhile, an ambulance arrived to shift Ramamurthy to a hospital. The bike ambulance service was launched on April 16 with the objective of attending to road accident victims. But the service has expanded to cover other medical emergencies like heart attack, breathlessness, fever, giddiness and animal attack. 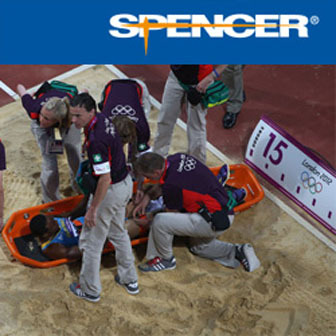 Under the ‘Platinum 10’ motto, the aim is to reach the patient in 10 minutes and administer first aid. Till September 11, the bike ambulances, managed by GVK Emergency Management and Research Institute (GVK EMRI), had attended to 963 cases. Of these, 653 were road accidents and 98 non-vehicular trauma cases. The rest include fever, infection, epilepsy, stroke, burns, cardiac issues, respiratory problems, diabetes, suicide attempts and accidental poisoning. The EMT is trained to administer first aid on the spot before a four-wheeler ambulance arrives to transfer the patient to a hospital. 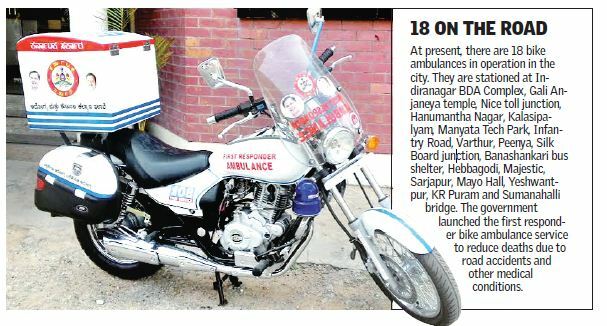 Madhusudhan, programme manager, operations, GVK EMRI, said, “At present, we are operating 18 bike ambulances in the city. They are strategically placed in thickly populated areas and those places where it would be difficult for four-wheeler ambulances to reach patients due to traffic. We send both the bike and four-wheeler ambulances to the spot anyway.” According to him, narrow roads and heavy traffic, especially when it rains, are the main challenges to service personnel. Bike ambulances work from 8 am to 8 pm, and are hands-on during peak hours. As for the EMTs, after completing a diploma in nursing, they have to undergo training at GVK EMRI for 45 days before going into the field.